Hercules has a home! - Rocky Mountain Great Dane Rescue, Inc.
Hercules has a home with his forever family in Castle Rock, CO! 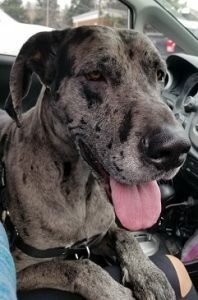 Sandra and David currently have a 3 year old Dane named Georgia, and are so excited to be adding Hercules to their family!! Hercules will have a giant back yard to play in and run off his 2 year old energy! He will also enjoy camping trips and being outdoors with this active family. Sandra & David get together weekly with their daughter who also has a male Great Dane, so Hercules will be having so much fun and keeping busy in his new home! We are so happy for Hercules and his new family! Way to go sweet boy!